We just wanted to take a minute to wish you all a Happy New Year and thank all our customers for making 2017 a huge success. From weddings, corporate events and private parties we have shared many memories and success stories. Providing services and entertainment for your special event is what we excel at! A Strategic Leadership event held at Cranage last November, with an International delegation from 7 countries including Japan, making use of AO Events entertainment services. No party today is complete it seems without a photo booth, to really make the party swing. We can supply a state of the art photo booth, complete with touch screen and built in printer. Coupled with our prop supplies your guests will love this added touch at your big event. LED letters have created quite a buzz in 2017. These giant illuminated letters, over a metre in height, provide a spectacular focal point for your big event and look fantastic as a backdrop for photographs. Coupled with our wirelessly controlled mood lighting the entire ambience of your event can be enhanced and controlled. Colours can of course be matched to your colour theme, giving you greater scope to create that extra special party experience. Our DJs know how to get your party going but probably our most exciting new service is the supply of amazing 3D infinity dance floors. 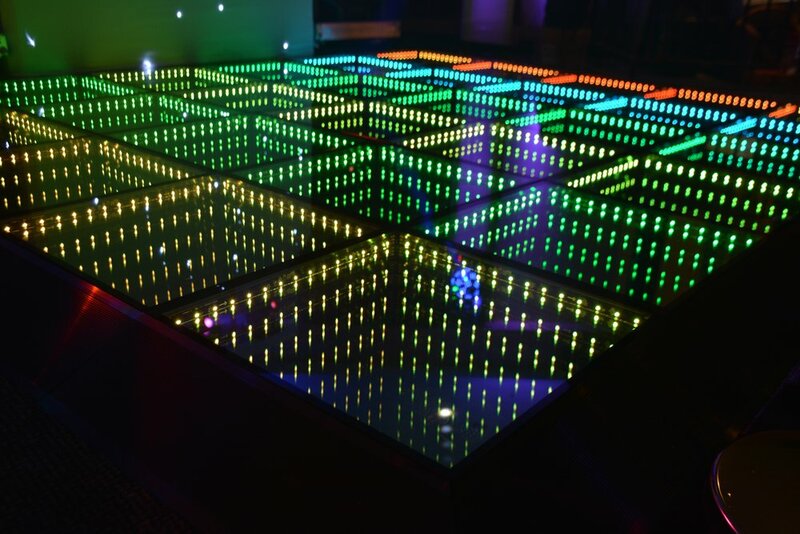 One of the latest trends to hit the dance scene, these incredible, cutting edge dance floors create a thrilling and unforgettable experience and will ‘wow’ your guests. You get the dizzying sense of partying the night away whilst being immersed in a sci-fi narrative such as The Matrix or Tron. In addition we supply the sleek and minimalistic white LED dance floors if you want to make your guests feel super cool and stylish. This will create an elegant feel to your celebrations. Black is also available for that sophisticated night club feel. AO Services really understand what entertainment is about and offer the full range of services from pop up marquees to selfie mirrors; taking your event to the next level with unique and memorable experiences.